You know that annoying temperature curve where if you’re just a few degrees out you need to start tempering your chocolate all over again? Well with mycryo cocoa butter it’s so much easier to temper chocolate!!! We discovered this at a Meilleur du Chef workshop near Biarritiz a few months ago and since then my chocolate decorations have been quickly and conveniently produced. Not like before when I’d sometimes be heard mumbling ‘Oh dear, the chocolate isn’t hardening as it should! I could swear I followed that chocolate curve!’ And my softening chocolate shapes would be crying ‘Help! Someone please temper me properly!’ I’m sharing this with you so we can all have easy snappily shiny chocolate decorations that are happy and don’t need to live in the fridge. Yes you’ll have to find some mycryo cocoa butter but it’s totally worth the search and there are links below for ordering this magical stuff online. You just melt your chocolate to a maximum temperature, allow to cool to another specific temperature, stir in a very small amount of mycryo cocoa butter, cool a short time again then use. Oh the relief and joy. Hurray! By the way, some of the extra shiny lollies were sprayed with edible gold glitter. 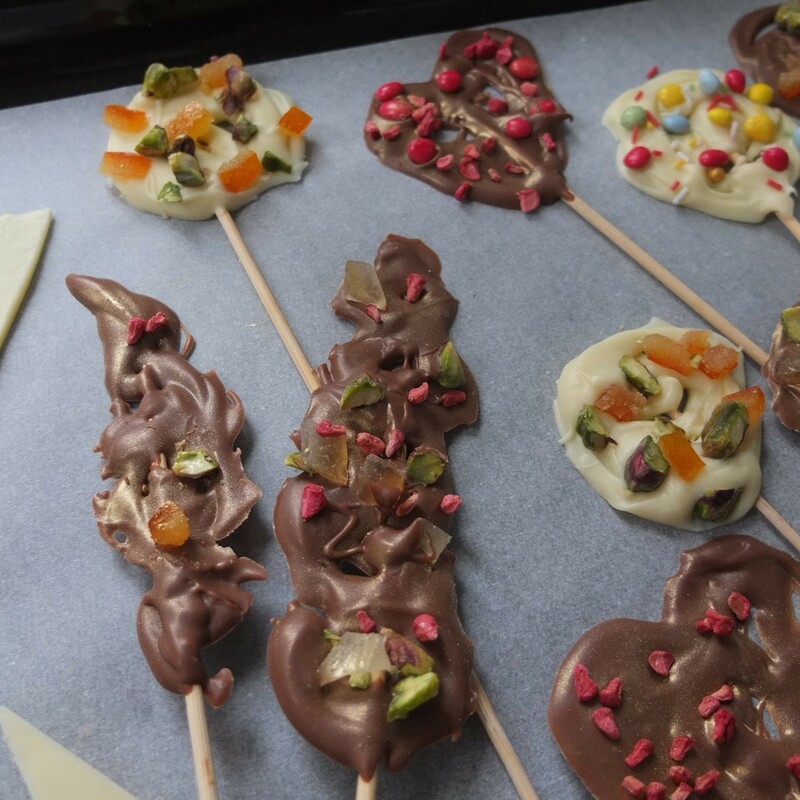 Decorating stuff – prepare all the materials for your chocolate decorations. Plastic sheets (food quality) – or cut up some disposable piping bags like I did (see photo further down). For chocolate lollilops: set sticks out on the plastic sheets. Have a teaspoon ready. 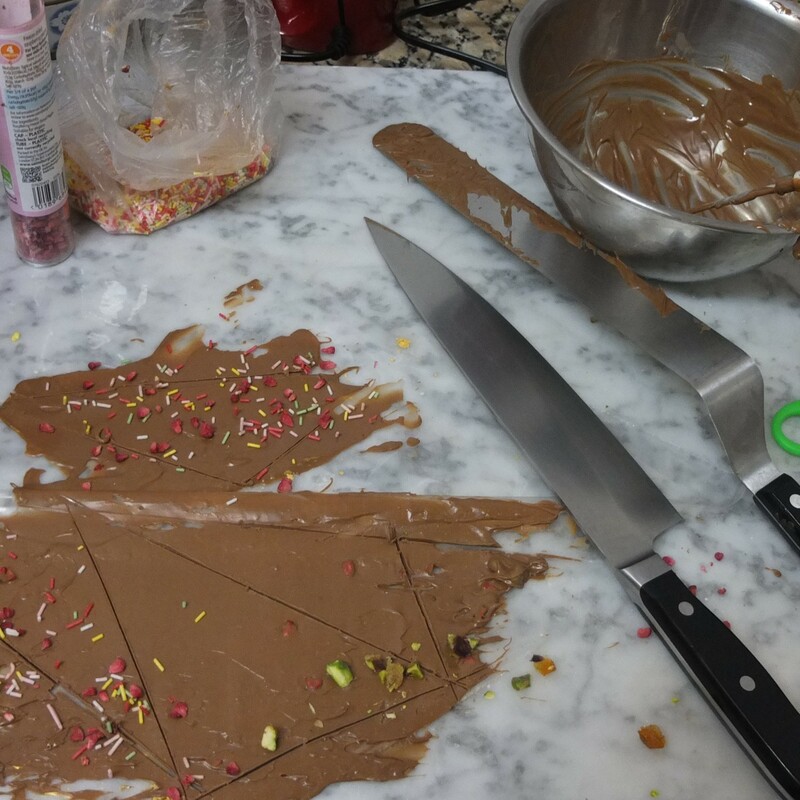 For chocolate shards: have a small or large offset spatula knife ready to spread the chocolate. 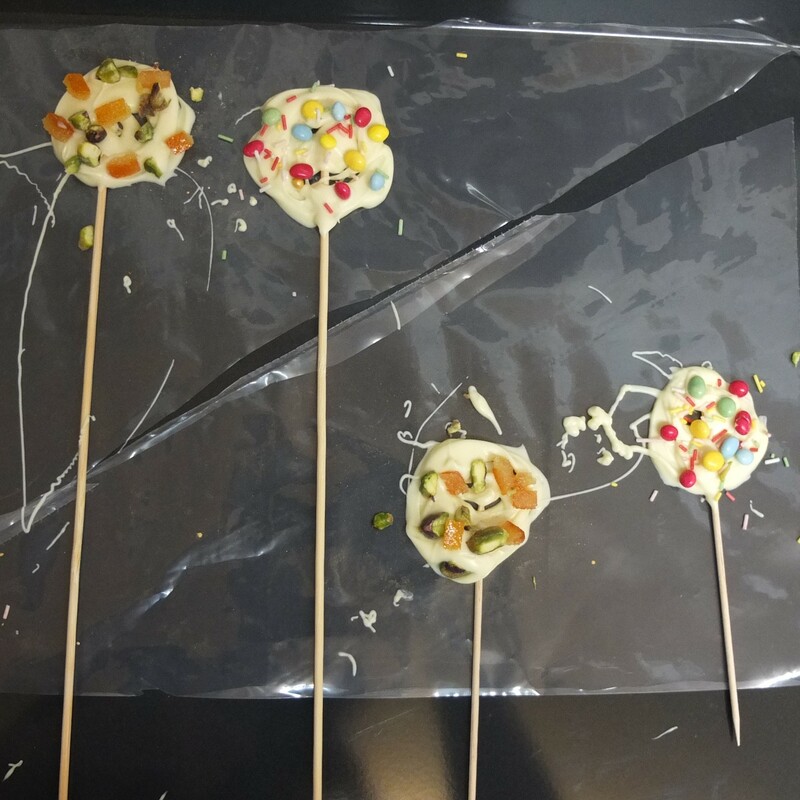 For both lollies and shards: have sprinkles, coloured chocolate drops, chopped nuts and candied fruit, etc. ready to sprinkle on. For chocolate curls: prepare thin strips of plastic and objects to hold down the ends. 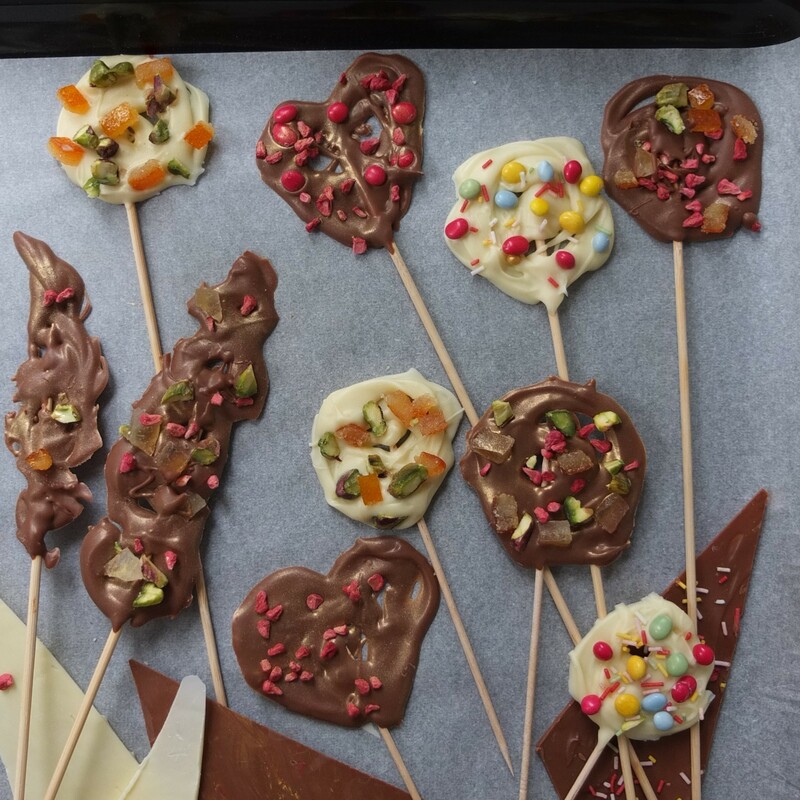 You can also use a rolling pin or round handles to curl your chocolate around. Instructions for tempering couverture milk chocolate are on the Meilleur du Chef website in French here, for dark chocolate here and white chocolate here. Maybe they’ll translate into English in the future but their step-by-step photos should still help you. These are the instructions for tempering white and milk chocolate. 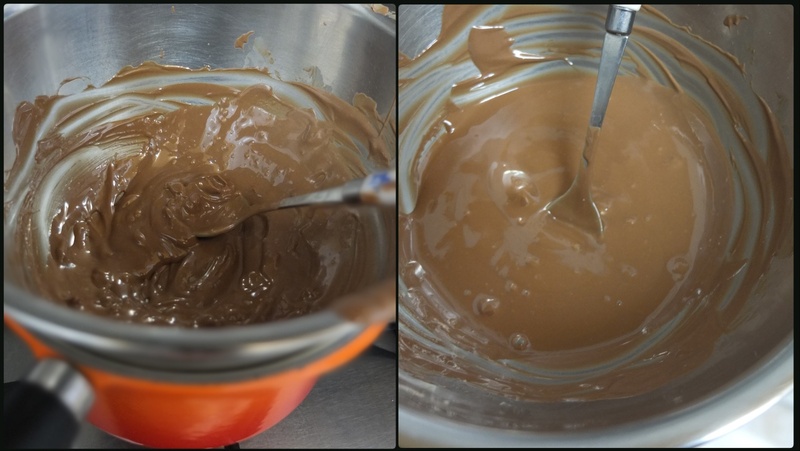 Melt your chocolate on a bain marie (or use a microwave, melting in 20 second bursts, stirring well between each burst and checking the temperature). Once off the heat (and off the bain marie) let the chocolate cool to 34ºCelsius/93ºFahrenheit. Sprinkle on the mycryo cocoa butter and wait a few seconds as it melts then stir in to combine. Decorations – work quickly before your chocolate hardens. For lollipops get a good blob around your stick so it stays on. Swirl with a teaspoon leaving some gaps to create a less ‘solid’ look. 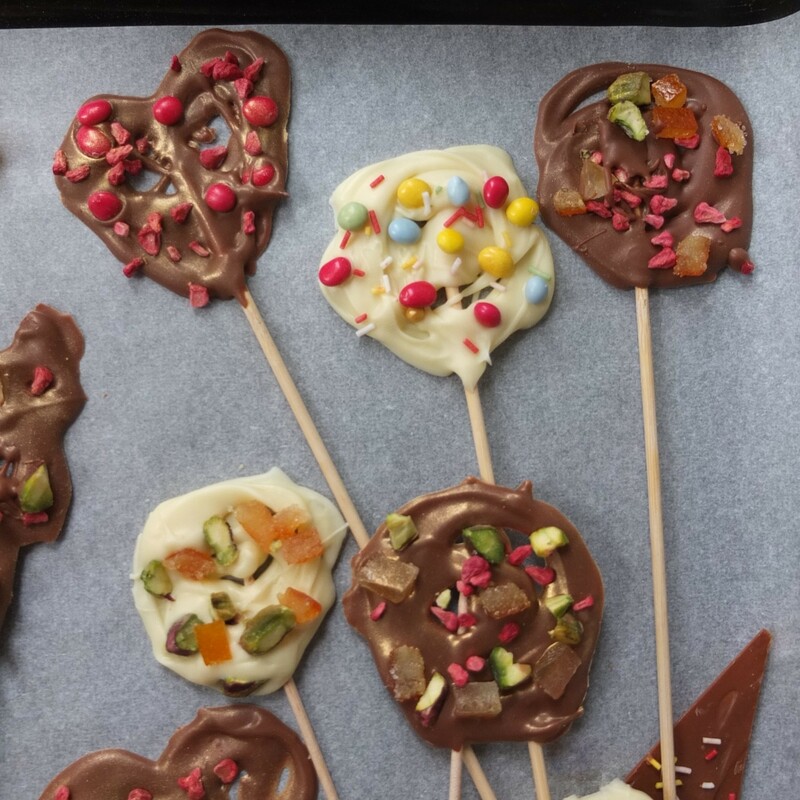 Make sure you add sprinkles or colourful chocolate drops quickly before the tempered chocolate dries. For shards spread to and fro thinly on plastic sheet. If you want to add sprinkles or nuts do it quickly now. When it starts going less shiny, you touch it with your finger and when it doesn’t stick cut shapes like triangle-style shards. Some more info is on my page in the basics section: making thin decorative shapes with tempered chocolate. For curls – also spread to and fro thinly on the plastic sheet and quickly curl up the sheet and fix so it stays in position. Sorry, didn’t get photos of the ones I made for the Mandarin log cake. But here’s a couple of great youtube videos showing various chocolate decoration techniques (they use transfer sheets but you can use plain plastic sheets). As the man says, you can also use Candy Melt-type chocolate if you don’t want to temper. I’m just so happy there’s a way to make chocolate decorations that consistently harden with very little fuss or time. 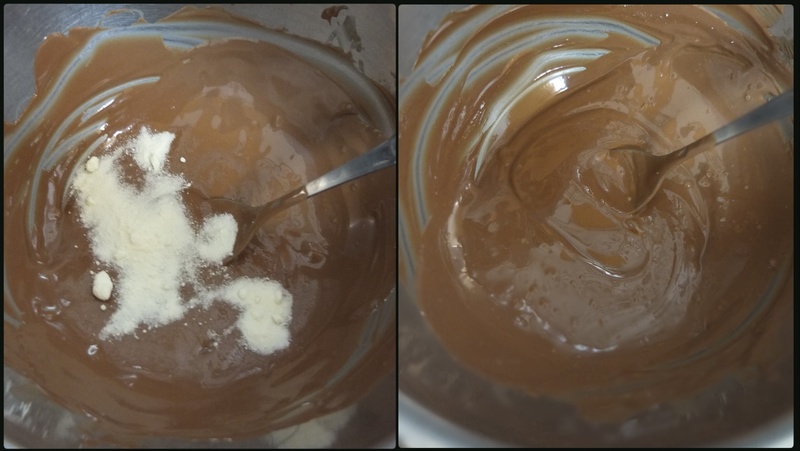 Maybe tempering chocolate with mycryo cocoa butter can be useful for you too! Lovely lollipops ! Finding your instructions very useful ! !